Francis Kendall Husband was the last of the travelling bards of Ireland, England Scotland and Wales. He walked the roads and relied on the goodwill and generosity of the people in the places he visited. In return he entertained with his poetry and some music on his mouth organ. Born in Somerset in England he referred to himself as a “Knight of the Road”. Having converted to Catholicism he became a very religious man, and claimed to have met with three Popes during his wanderings of Europe. He carried around with him mementos of these meetings. In the 1960’s and early 1970’s Francis Kendall Husband was a regular visitor in many villages and towns around the west coast of Ireland. When in Carron he always came to Cassidy’s pub, where my Mother, Mrs Mary Cassidy, fed him. 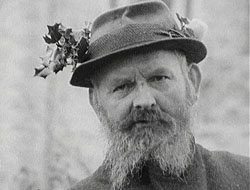 He would recite poetry and play his mouth organ in the pub to an audience of local farmers and herdsmen before retiring to sleep at night on hay or straw in one of the sheds or outhouses. In the morning he would be on his way to his next stop. My last memory of Francis Kendall Husband was in the early 1970’s only months before hearing of his death. He came to the pub and did his recitations, receiving some sustenance before going to what was then “The Car house” to sleep for the night. In the morning my sister Nuala and I were sent down to the car house with two pint bottles of Guinness and brown bread sandwiches in tin foil. He asked us to thank our Mother for the food and bestowed some blessing on us before packing his belongings on his back and heading off. The hostels are built on the site of the carhouse where he stayed. And tinkers fight with madness, whilst tramps sleep out in hay. But there are some who really try thy freedom to despise. Who carry out the works of Christ, some seldom really do. Who roam about from town to town, but Holy men are few. Except by meditation, on sin beyond compare. As a tribute to the memory of Francis Kendall Husband and in an effort to revive the travelling bard tradition Clare’s Rock in association with Cassidy’s Pub in Carron village will over the course of the summer, host many of the finalists in the Bard Of Armagh festival on the third weekend of every month, from March to September. The Bards will perform their own compositions and make up part of what should prove to be most enjoyable weekends.